Say “hello!” to Cheryl Winkelman! Cheryl is one of our friendly and knowledgeable Battlefield Bus Drivers, and has been for over 8 years now! 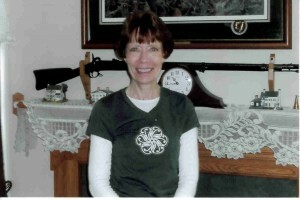 After moving to Gettysburg from Northwest New Jersey, Cheryl really grew to know and love the area. She first got behind the wheel in March of 2004, and she hasn’t looked back since (except when backing up or using her mirrors). Her favorite part of the job is meeting people from around the world, and she recommends that all visitors check out the battlefield and the Visitor Center, and to explore all the shops, restaurants, and museums that downtown has to offer. Book your Battlefield Bus Tour today and meet the rest of our wonderful team! Posted in Guides and tagged Battlefield Bus Tours, Bus drivers, Cheryl Winkelman, Gettysburg bus tours, Visitor Center on June 10, 2012 by jamessear.